What sort of Latin and Greek grammars do we need online? How can existing public domain resources be re-worked, modernized, and leveraged to best serve the community of Latin and Greek learners and scholars going forward? The current state of things is best represented by The Perseus Project, which early on digitized important English language grammars by Smyth (Greek) and Allen & Greenough (Latin), among others. This version of A&G has hyperlinks, and navigation by chapter number, and is searchable. 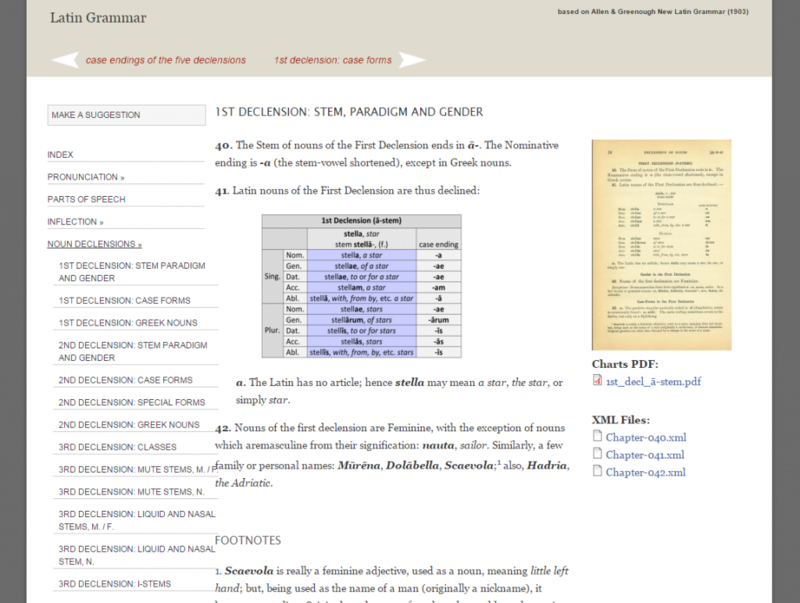 At DCC we have been working online grammars for a few years, and the results so far have been a newly digitized Greek Grammar by Thomas Dwight Goodell, and a revised digital version of Allen & Greenough’s Latin Grammar, based on XML files kindly provided by the Perseus Project. 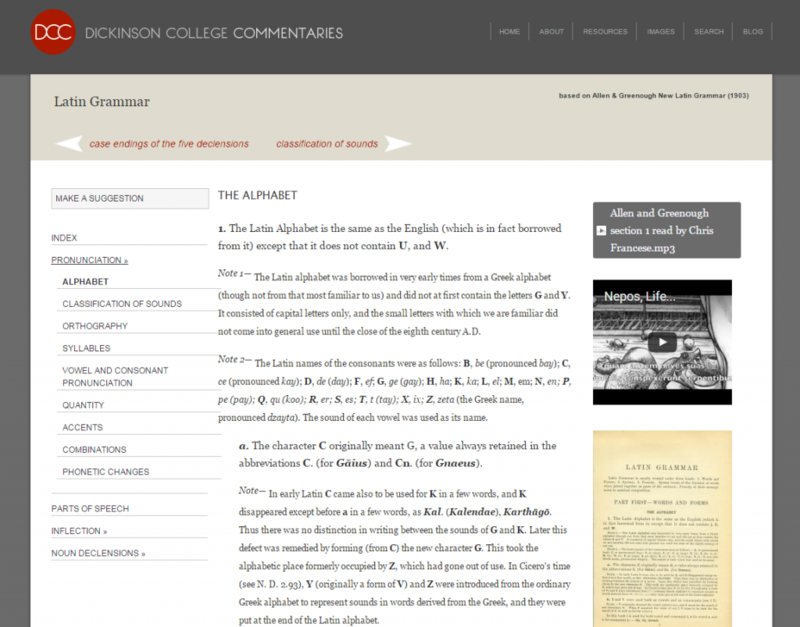 As we prepare to revise Allen & Greenough again in the process of moving it to Drupal (the CMS for our main site), it seemed like a good time to ask for ideas and suggestions on what would be most useful. First, some background. In the fall of 2013 Kaylin Bednarz (Dickinson ’15) scanned a copy of the 1903 printing of Allen & Greenough so that we had good quality page images. Then she cleaned the existing XML files from the Perseus Project, linking the XML files to the photo scans on Dickinson servers. Using the new scans Kaylin also created new XML files for the index of the book, which had not been included in the Perseus version. The purpose there was to make the book browseable via the index, which is important for user utility, and absent in all other online versions. For example, a search in the Perseus version for the term indirect discourse yields six results, rather confusingly displayed, and you could sort through and find what you need. But the index itself is analytical and gets you right where you want to go. Kaylin then created html files based on the XML. She was assisted and trained in the use of Oxygen software (which converts the XML into web-ready html) by Matthew Kochis, Postdoctoral Fellow in Digital Humanities at Dickinson. In late March, Dickinson web developer Ryan Burke uploaded the page images, html, and XML files to Dickinson servers, and created the web interface for our version of A&G. This revealed issues of formatting: indentations were often not preserved, resulting in lack of clarity. Some character formatting was not right, especially in charts, and footnotes from the original print resource were not clearly displayed. Forward and back buttons had to be put in for each of the 638 sections. Meagan Ayer (PhD in classics and ancient history, University of Buffalo, 2012) began work hand-editing Allen & Greenough html files, removing errors and fixing formatting, adding navigational infrastructure using Adobe Dreamweaver. A few missing XML files had to be added and converted to html. All this work is now complete, and the results I would characterize as somewhat underwhelming. The interface is not attractive, and navigation and searching, always a weak point in the Perseus version, has only been marginally improved (though I do use that index fairly regularly). More importantly, there is no easy way to add things, like audio, video, test question banks, anything. In the fall of 2015 Meagan and I designed a content type in Drupal so that we could transfer the existing html pages into a more flexible and media-friendly box. Ryan Burke built the content type, and Meagan is now in the process of transferring content and making colored versions of the charts as .jpg files that could be consulted as a group. The Drupal version will allow for linked translations, as with our core vocabulary. For example, we hope to have a Chinese version in the next five years. Drupal’s translation module allows us to keep all versions tied together and easily edited. Drupal also has tagging features for enhanced searchability, and allows for embedded and tagged images, audio, and video. And here is a sample with one of Meagan’s colored charts. You can also see the chart as a downloadable .pdf, and download the XML if you wish. Now that we have a designated zone (at the right) for media, what exactly should go there? Pedagogical advice? Video a la Khan Academy? Banks of multiple choice quizzes? Commentary that modernizes the discussion of the grammar? Examples for the corpus of Latin (a la Logeion)? What do you think?